Stress-relieving guinea pigs, a three-legged cat and several dogs are among animals Cambridge University "employs" to help students during exams. Students can have tea with ginger tom Jasper or take college dogs for walks. However, the pets need to have a certain temperament, as proven by its latest "walkies" recruit - a dog that took one walk then refused to move. The university said the animals seemed happy to help and aided stressed students and those missing their pets. Staff from several colleges have brought in pets for those studying. The deputy librarian's three-legged cat Jasper has been entertaining students at the Marshall Library of Economics for several years. "Tea with Jasper" events have sometimes attracted more than 100 people. 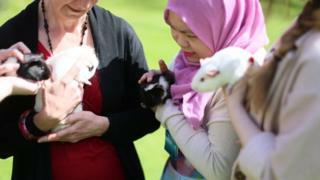 Four guinea pigs adopted by Lucy Cavendish College have proved an equal hit with students, who can pet them while they play in the garden. Laura McClintock, student union officer, said: "It'll be good for us to care for them, and a welcome distraction from deadlines." Other four-legged friends include Corpus Christi's spaniel Jack, who is regularly booked for "walkies". Student Nina Jeffs said walking him was "like a taste of home" and helped her relax. Stephen Buckley, head of information at mental health charity Mind, said many people "find that connecting with animals or caring for a pet can bring lots of benefits, resulting in a positive impact on wellbeing". "Lots of people who experience a range of mental health problems report that playing with an animal or taking a dog for a walk helps them switch off from everyday pressures, helps clear their heads and relieves stress," he added. A spokesman from Pets as Therapy, a charity which provides "therapeutic animal visits" to establishments including hospitals and universities, agrees that "examinations put a lot of pressure on students" and time with an animal "can really help alleviate stress and anxiety, allowing the student to calm and rationalise their situation". The charity said research conducted in collaboration with the University of Lincoln into human-animal interactions using a sample of school children "clearly indicated that the pupils receiving an animal visit had far lower cortisol levels and therefore were much less stressed". Meanwhile St Catharine's College has Toby the dog, who serves the same purpose. However, Sidney Sussex College's attempts to replicate this did not go to plan. Jack Russell terrier Twiglet took only one walk with students before she sat down and refused to move, deciding being a relaxation dog was not for her. The Cambridge Student and other media reported the stress-relief dog was too stressed by the role and was "retired" after just one day. However, a university spokeswoman insisted: "Twiglet is not stressed, she is perfectly fine - the worst thing that can be said about Twiglet is she knows her own mind."